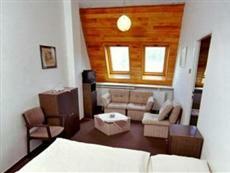 The Hotel Belaria is perfectly located for both business and leisure guests to Hradec nad Moravici. The Hotel Belaria boasts a convenient location with modern amenities in every guestroom and superb service. Each of the hotel's guestrooms offers television, shower, satellite/cable TV.The basic amenities provided at this Hradec nad Moravici accommodation comprise 24hr room service, shops, bar/pub, laundry service/dry cleaning, restaurant, room service, business center. Leisure and sports facilities available on the hotel's property comprise massage, indoor pool, gym, sauna, tennis courts. Modern comfort and convenience are seamlessly combined to ensure the guests' satisfaction. Make your reservation at the Hotel Belaria Hradec nad Moravici now by selecting your chosen dates of stay and submitting our secure online booking form.